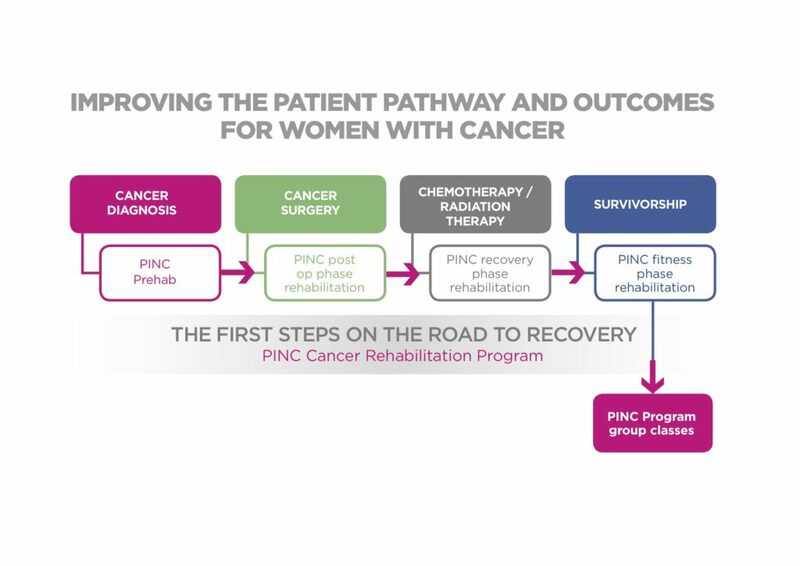 The Pinc and Steel Cancer Rehab is a personalised therapeutic programme that is offered to women and men recovering from cancer surgery and related treatment. Vicky Hill is our qualified cancer rehab physio for Central Lakes Physio and is the only provider in the Wanaka area. The Pinc and Steel Cancer Rehab Programme is suitable after any type of cancer treatment and accommodates all fitness levels. The programme addresses the physical effects of chemotherapy, radiation and hormone therapy. It can also help reduce the risks of treatment-related side effects such as lymphoedema, shoulder problems, scar tissue formation, fatigue, and weight gain. Post-op Phase – Designed to assist in the healing process of clients who are recently post surgery or undergoing treatments. To restore strength and flexibility to particular joints and muscle groups that have become weak and inflexible as a result of surgery. It incorporates breathing techniques and gentle exercises modified to maximise recovery from surgery. Recovery Phase – Designed to help improve energy levels and general well being during cancer treatments. It aims to help clients manage fatigue, restore post op flexibility and strength. In addition to focusing on stretching and strengthening exercises for the upper body, it also contains workouts for the lower limbs, abdominal strengthening and spinal stability. Fitness Phase – Designed for overall conditioning and to increase stamina. Aims to improve fitness, strength and flexibility in order to increase endurance, elevate the metabolism, improve muscle tone and body composition. It contains workouts for the upper and lower limbs, abdominal strengthening and spinal stability. Designed to motivate and encourage good exercise habits for life. There is funding available on a means tested basis. If funding is approved by the Pinc and Steel Trust treatment is free, otherwise private charges apply. “To be able to start a program of pro-actively healing my body with Vicky and her Steel Cancer Rehab program at Central Lakes Physiotherapy was the first step in regaining control over my life and health. After my surgery I was bombarded by the potential negative side effects of a full axillary node clearance. Of course you need to be careful but I needed to start thinking positively and working around these limitations while focusing on what I could do to minimise the side effects and get back to my active lifestyle. Vicky was fantastic right from the start. She listened to what was important for me and what we needed to do to start on my pathway to regaining my fitness, health and general feeling of well-being. The program was a combination of physio sessions and ‘home-work exercises and treatment’ that would help heal the scar tissue, nerve damage and mobility and use of my left shoulder. The results and the process where fantastic. My doctors and surgeons could not believe the softening of the scar tissue around my wound site. The nerve pains and cording I was suffering earlier are now hardly recognisable with only a slight numbing sensation. My shoulder mobility is quite astounding really with nearly full range of motion regained and I am now back kayaking!